This candid WWII memoir features diaries of two crewmembers of LCS(L)(3) 118. The diaries of gunner Earl Blanton and radarman Jim Ries frankly describe several kamikaze attacks and their aftermath during the Battle of Okinawa. This LCS(L)(3) (Landing Craft Support, Large, Mark 3), nicknamed "mighty midget" due to her heavy armament, earned a Navy Unit Commendation for her crew's shooting down four (one considered probable) kamikaze aircraft, putting out fires aboard an LST (Landing Ship, Tank) hit by a kamikaze plane, and providing other support to radar picket ships for a total of 50 days during the Battle of Okinawa. Despite battle action for three months, the crew of some 70 men all survived. Chapter 1 gives background information on the LCS(L)(3) amphibious assault ship. The Navy used 130 of these small fighting ships during WWII, and many of them saw battle action at radar picket stations around Okinawa. The other ten chapters, arranged in chronological order, tell the ship's history through the two crewmen's diaries, the ship's official deck log, and author Earl Blanton's comments. About half of this book describes action during the Battle of Okinawa from April to June 1945. The author provides helpful summaries of battle action for each month and for the entire Battle of Okinawa. The book contains many other valuable resources such as seven pages of photos, a glossary including meanings of acronyms, and a listing of officers and men on the ship during different time periods. 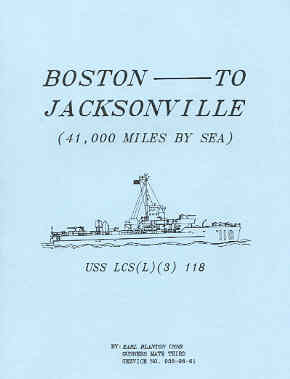 There are also several helpful illustrations (including a layout of main deck and first platform) and a world map of the voyage of LCS(L)(3) 118 from her commissioning in Boston on November 23, 1944, to her decommissioning in Jacksonville on June 6, 1946. On the first day of the Battle of Okinawa (April 1, 1945), a kamikaze plane crashed into the port side of LST 884. Fires broke out both topside and below deck, so about 300 men abandoned the ship loaded with fuel and ammunition after failing to extinguish the blaze with the ship's limited water supply. LCS 118 soon arrived and used fire hoses to direct water onto LST 884's deck after a couple of other ships had difficulty in approaching the burning ship due to high swells. LCS 118 then went alongside the LST, and several crewmembers boarded with fire fighting equipment. With later assistance from three other LCS(L)(3)s and a destroyer, the fires were brought under control in the midst of exploding ammunition. The boarding party found seven marines below deck who had been burned to death. 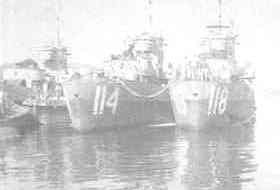 A little after 8 a.m. on May 4, 1945, 18 or 20 planes (according to Ries' diary) attacked Radar Picket Station 12, where the destroyer Luce (DD-522), LSM(R) (Landing Ship Medium, Rocket) 190, and three LCS(L)(3)s including the 118 were on patrol. One attacking plane, despite being hit by LCS 118 gunners, crashed amidships into Luce, which sank in less than ten minutes. LCS 118's forward guns shot down an attacking Betty bomber, which crashed into the water about 100 yards ahead of the ship. LCS 118 picked up 114 Luce survivors from the thick oil slick on the water, and LCS 81 picked up another 47 survivors. Another kamikaze plane hit LSM(R) 190, which sank about 45 minutes later. At about 2 a.m. on June 3, 1945, an LCS(L)(3) 118 gunner from New Zealand named "Limey" Jones single-handedly shot down a Japanese aircraft with the forward port 20mm gun when the plane passed overhead the LCS(L)(3) 118, after other ships at Radar Picket Station 16A had failed to bring the aircraft down. In the afternoon of June 6, the guns of LCS 118 opened fire on a kamikaze plane that suddenly dove from the clouds, and it crashed in flames about 200 feet from the destroyer Cowell (DD-547), whose gunners were occupied firing at another Japanese plane directly ahead. They were sunk by the latest Jap weapon - the suicide plane. We were told about them some time ago and that we might expect them. In Japan before a raid these pilots are taken before Tojo and are declared officially dead. Their property is settled, insurance paid off, and all the business a dead Jap would have is taken care of. He is happy for he is to die for the Empire, and his family is happy for he is a hero, and all that bunk. A lot of them have special armor planes that can take a lot of punishment before being shot down, and some of them fly old crates, and some of them regular planes. One of the marines was telling me about a Jap suicide plane who landed on the field on his own accord after the other two planes that were with him were shot down. He stepped out of the cockpit with his hands up and dressed in a white robe. You see, the Japanese give their suicide pilots their burial ceremony before they leave the homeland, as they are not supposed to come back. To the Japs, it is an honor to die for the emperor by crashing your plane. Well, this pilot was understood to die in this manner but, I guess he figured living was much easier. He spoke English very fluently. They put the pilot in the brig and I think they are going to send the plane back to the states, maybe for exhibit, it was in 4.0 condition. The above diary excerpts provide lots of conjecture based on rumors, and they reveal typical misimpressions that US military personnel during WWII had about kamikaze pilots. When the Japs gang up and they are suicide, you don't have much chance, for no matter how good a shot you are, you have to shoot everything apart except the prop to keep them from diving into you. Over 9/10 of the ships lost here are being sunk by suicide planes, boats, or swimmers. That just shows what kind of people we are up against. Maybe it's fair fighting, but I don't see it that way. In 24 hours time right around here there have been two cans [destroyers] and two LSMs sunk and several others damaged. There have been at least 300 men killed. To them - today a total of 18 planes shot down around us according to radio - I couldn't count them all, but I think I saw most of them go down - out of 18 sent. They lose every plane they send out , but yet what is 10 planes or 20 planes to one Destroyer. These patrols are really suffering but we are doing what we came out here for. We are intercepting the planes and destroying them and above all keeping them away from the island and main anchorage. Only a few are getting through. It's only a matter of time at this rate before every ship will get it, but we will hold these little bastards back at any cost - so help us. Many WWII ship histories written decades after the war tend to embellish accomplishments and to use generalities to describe events. In contrast, the two diaries at the heart of this LCS(L)(3) 118 history give unvarnished contemporary accounts of kamikaze attacks and their aftermath that many LCSs experienced at radar picket stations during the Battle of Okinawa.